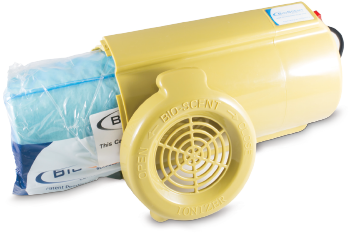 Bioscent Technologies has designed and developed a unique fragrance delivery system that not only controls odors but destroys them as well. Using a revolutionary negative ion process this solution not only removes dirt, bacteria and other allergens form the atmosphere, but also releases a subtle fragrance. The unit will disperse negative ions and a fragrance across 45 square metres. There is very little maintenance required, simply choose a fragrance and each month we will send you a replacement cartridge. Quickly and easily take off the front cover, insert the new cartridge and the unit is ready to use.